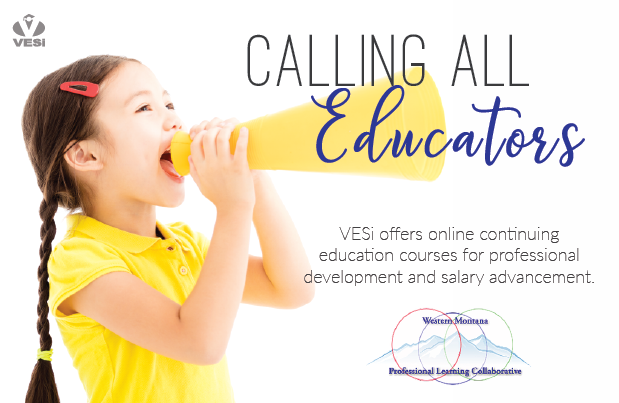 ​WMPLC is partnering with VESi to offer Montana K-12 educators online continuing education. Every course, on every device. To register for Montana OPI Renewal Units through Western Montana Professional Learning Collaborative, please call VESi at 1-800-313-6744 between 8:00AM-5:00PM PST, Monday through Friday.VESi recommends that you check with your school district and/or state licensing agency to verify these course offerings will meet your district and/or state requirements for salary advancement and/or state certificate re-licensure.